Dorje Lekpa (Skt. Vajrasādhu; Tib. རྡོ་རྗེ་ལེགས་པ་, Wyl. rdo rje legs pa) is a protector of the Dzogchen teachings. Before being bound under oath by Guru Padmasambhava, he was the god of gambling and war. 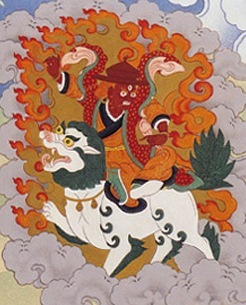 He is depicted riding upon a snow lion and wearing a wide-brimmed hat. This page was last edited on 28 March 2018, at 19:24.